As summer came, the season of beer sales has started. Consumers saw imported beer in the best shelf spaces in many big supermarkets. Profits from selling imported beer are much higher than from Chinese sorts which created a great problem for the local brewers. At supermarkets one can find dozens of expensive, well-known import brands. Beijing Youth Daily writes that the price for a 0.3 l beer can varies from 6 to 28.9 yuan and a half-a-liter bottle usually costs 10-20 yuan. 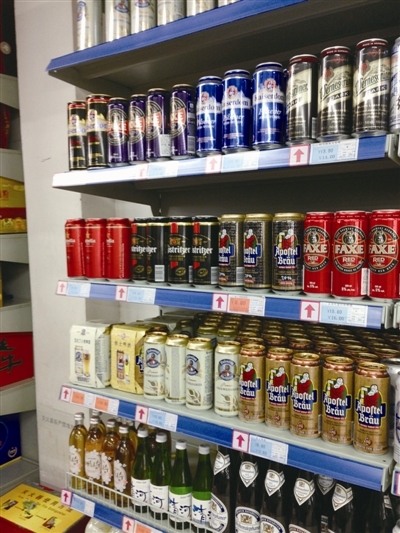 For example, in Beijing Century Lianhua Supermarket located beyond East Third Ring Road, the price for German beer Kostritzer is 18 yuan for 500 ml and Belgian Hoegaarden costs 8.25 yuan for 300 ml. Import beer is as a rule 30%, more expensive than Chinese premium and in some cases twice the price of a 300 ml can. For example, the same volume of Tsingdao costs 4.2 yaun. Besides, one can find barrels of 5 l on the shelves. Yet, consumers do not consider such prices unreasonable. Just several years ago, the main sales channel for imported beer in Beijing was “the night market”: clubs, bars, and restaurants. But now the situation has changed, as import beer brands are easy to find in the retail. The steady growth of import was stimulated by free trade zone, zero rates and other reasons. Starting from 2012, the net sales growth of import beer reached 737.2% against the decline of production by Chinese producers over the previous years. China imported 100.39 million litres of beer for the period from January to March 2016. This year the growth in the first quarter was 34.2% versus 74.7% of last year. In experts’ view the domestic beer branch can still undergo adaptation period due to the influence of AB InBev and other foreign giants, import beer and craft beer. The domestic beer companies are actively changing their business strategies at the moment.